Slaty cleavage foliation composed of chlorite crystals. Unlike a slate the crystals in this phyllite have grown larger and light reflects more easily off the cleavage faces, leading to a high light reflectance (scheen), a characteristic feature of phyllite. Since light reflection is so important in getting a feel for this rock, typically the first thing a geologist does upon picking it up is to turn it over and over to catch all the properties and way light reflects. So, if you click on the image it will cycle you through three different views of this rock to see how light plays differently. 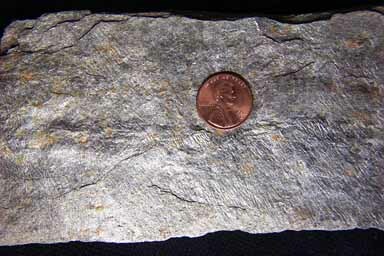 The precursor to this rock is a slate, and if metamorphosed more becomes a schist.